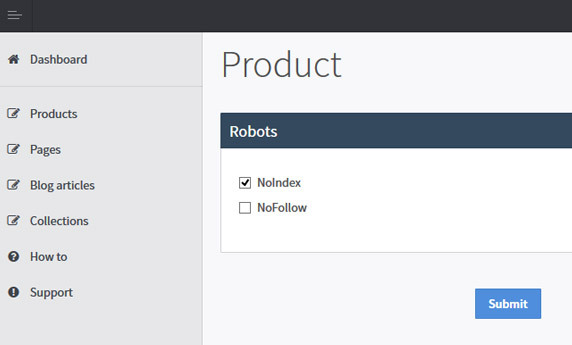 Take full control of how search engines view your online shop with the NoFollow & NoIndex Manager App for Shopify. This lightweight and vital SEO plugin helps optimise your Shopify store for search engine algorithms like Panda and Penguin, cutting out duplicate content issues, protecting your search ranking, and attracting more customers. Easily help search engines decide which store pages are important to you. Avoid duplicate content issues by choosing which pages you don't want to be indexed, and maximise your crawl budget by telling search bots where they don't need to go. No more Google Panda or Penguin problems! NoFollow & NoIndex Manager is designed from the ground up to help you maximise your shop’s potential when working with search engine algorithm updates, keeping your Shopify store in your customer's search results list. NoFollow & NoIndex Manager installs in under 20 seconds, and with simple yet powerful functionality and our helpful support staff ready to answer any queries you may have, you'll be up and running in no time at all. Need even more power over your Shopify Store’s SEO? The SEO & Social Meta Manager is just the job. With integrated NoFollow & NoIndex meta tagging, page title and description editing, control over social sharing, Google+ Authorship markup and much, much more, it’s the ultimate SEO tool for Shopify.